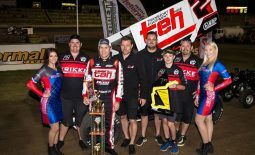 To say that the Krikke Motorsport team and their driver Jamie Veal dominated last weekend’s Krikke Boys Shootout at Quit Bunbury Speedway would be quite the understatement, wrapping up their 2017-18 season campaign in the best possible way. 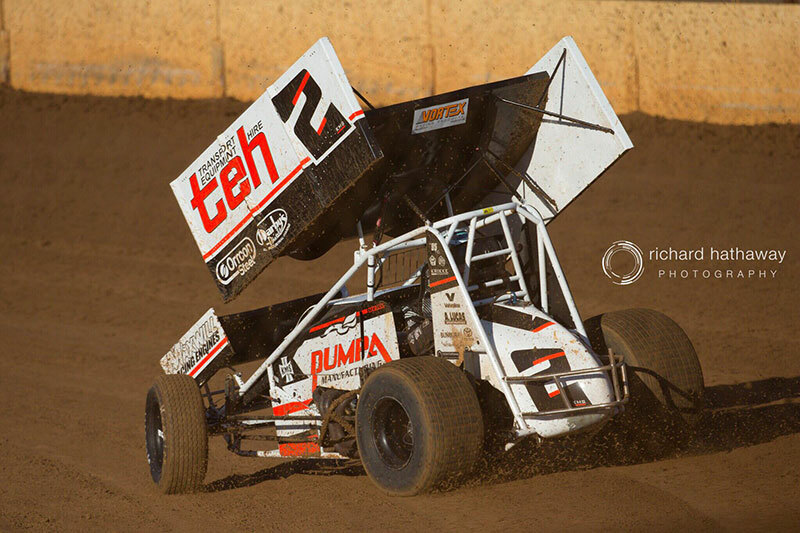 In what was the 21st running of the event, Veal, aboard the WA # 2 Transport Equipment Hire / Pumpa Manufacturing supported Maxim, managed to win Saturday night’s preliminary feature race, before backing it up with Sunday night’s $20,000 feature-race win in impressive fashion. 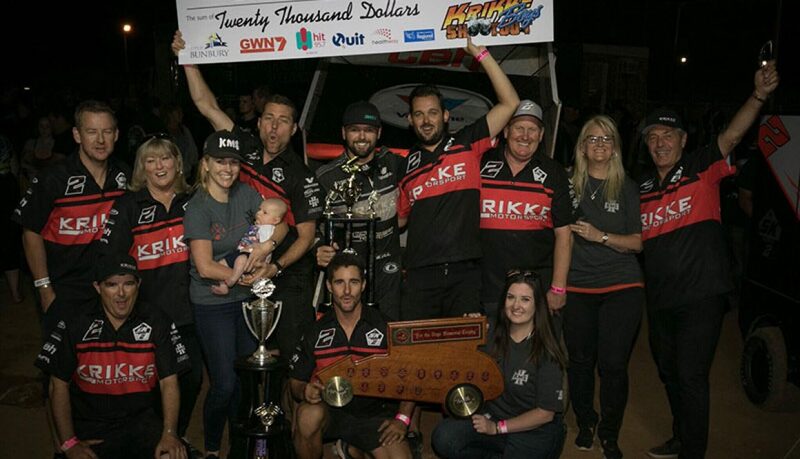 The Krikke Boys Shootout dominance completed the debut season together for Veal and the Krikke Motorsport team, which included their WA Title victory back in December, which was also their debut outing, and two World Series round wins (Latrobe, Tas and Bunbury, WA) on the way to a second-place finish in the final point standings, along with a preliminary feature-race win at the Australian Championship. Veal, a first time winner of the event, was rapt to finish on such a high. “I couldn’t think of a better way to finish our first season together by dominating a race that means so much to the entire Krikke family,” expressed Veal, who picked up the third Krikke Boys Shootout win for the team. Krikke Motorsport team manager Ryan Krikke echoed his driver’s comments. 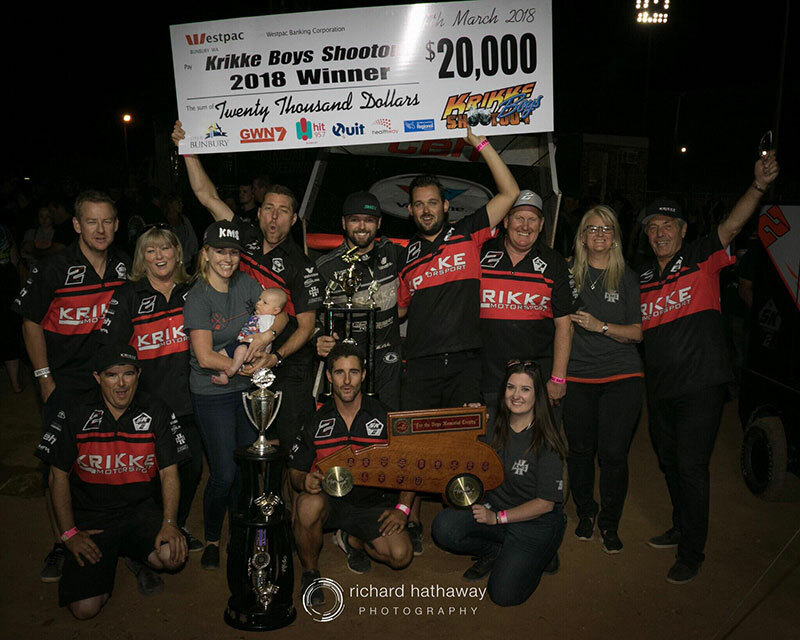 “The Krikke Boys Shootout is more than just a race to us, as it’s a celebration of three lives (Darryl, Jason and Shane),” said Krikke. With the 2017-18 season now at a close for the Krikke Motorsport team, they are now looking towards the 2018-19 season. The Krikke Motorsport team’s 2017-18 season team merchandise, including t-shirts, hoodies and hats which are available in a range of sizes, can be purchased through the team’s online store via the following link: www.krikkemotorsport.store. Fans can also purchase merchandise directly from the Bunbury Subaru dealership. 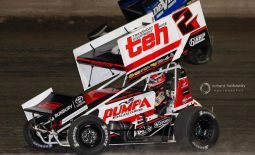 Krikke Motorsport would like to thank the following 2017-18 season sponsors: Transport Equipment Hire, Pumpa Manufacturing, Maxwill Racing Engines, PWR Performance Products, Valvoline Oils, Orrcon Steel, Darby’s Paints, Bunbury Toyota, BR Motorsports, Vortex Racing Products, A. Lucas Spraypainters, Skwid Signs, and Redline Media. 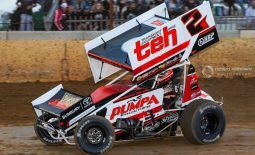 To find out more about the Krikke Motorsport team and to keep up to date with current news and results, visit their website at www.krikkemotorsport.com.au or follow them on Facebook, Instagram and Twitter by searching Krikke Motorsport.